Love our new humidor!! Helped freshen some dry cigars that we order.Looks great as decor in the living room!! 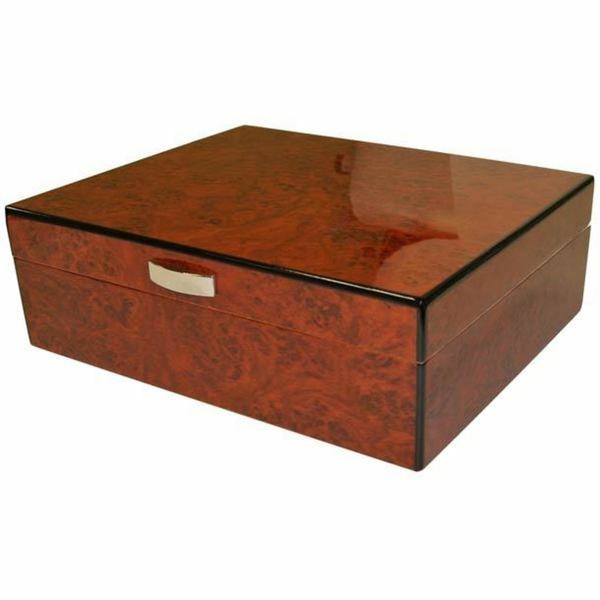 This solid and contemporary humidor has a gorgeous burl polished exterior and cedar lined interior. There is an included humidifier and hygrometer to help maintain ideal conditions within your humidor. Easily maintain your humidifier with distilled water to keep it working properly. Grab this incredible humidor from Visol today for a gift that will last for years to come. I bought this for my son and first saw it when I visited him. Not at all what I expected. Looks very cheap and doesn't look like wood. Looks like plastic or cheap shinny veneer. If I could have returned it I would have. As it is I will get rid of it and get him something he will not be ashamed to put out. Picture is deceiving. I would not recommend or buy again. Very disappointed. Family member cigar starter kit. He fell in love with it as soon as he opened it.